Japanese have loved eating fish since the Stone Age. This is probably because Japan is surrounded by the sea on all sides. I think Japanese eat fish more than Chinese do. You know, we Japanese have learned much culture from China & Korea. Some examples: Kanji (Chinese character), rice cropping, pottery, iron work, building styles, etc. Chopsticks also came from China. However, the shape is different. Chinese chopsticks have a square shape with a uniform width. Japanese chopsticks taper from one side to the other. This shape was developed in Japan. It is understood from history that this modification comes from eating fish in the Edo period (the 18th -19th century). Fish that live near the coast are small and have many small bones. It is hard to separate meat from bone with wide chopsticks. I used to work in a steel plant in North Carolina. Like Japanese and unlike Chinese and Koreans, Americans also do not normally eat fish with the head still attached. 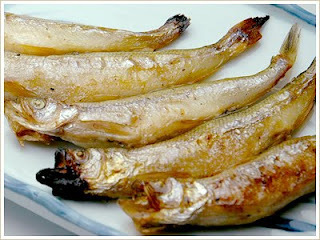 Japanese do eat small fish like sardines whole. I could get my hands on some fish with head in Atlanta, Georgia. Specifically, I could get the fish I especially love, shishamo (a saltwater smelt) which is 6” long 1” wide that still has fish eggs in its belly. It can be eaten whole, head and all. My wife would cook the fish for my lunch box. When I ate it, my friends and coworkers would leave my table. They thought I was crazy for eating the whole fish! My dad eats inago, a locust, a kind of grasshopper. It has very bitter taste, and when I ate it in childhood I thought he was crazy too! It was certainly interesting for me to read this article. Thanks for it. I like such topics and anything connected to this matter. I definitely want to read more soon. Well I assent to but I contemplate the post should have more info then it has. very useful article. I would love to follow you on twitter. By the way, did any one know that some chinese hacker had hacked twitter yesterday again. Nice post as for me. I'd like to read a bit more concerning that matter. Thanks for sharing this material. I tried using﻿ chopsticks while on my cruise and I mastered it in 15 seconds. These utensils originated from China, and since the ancient times, Koreans and the Japanese used these as well. It is believed that it originated from China, and since then, it has become a tradition.